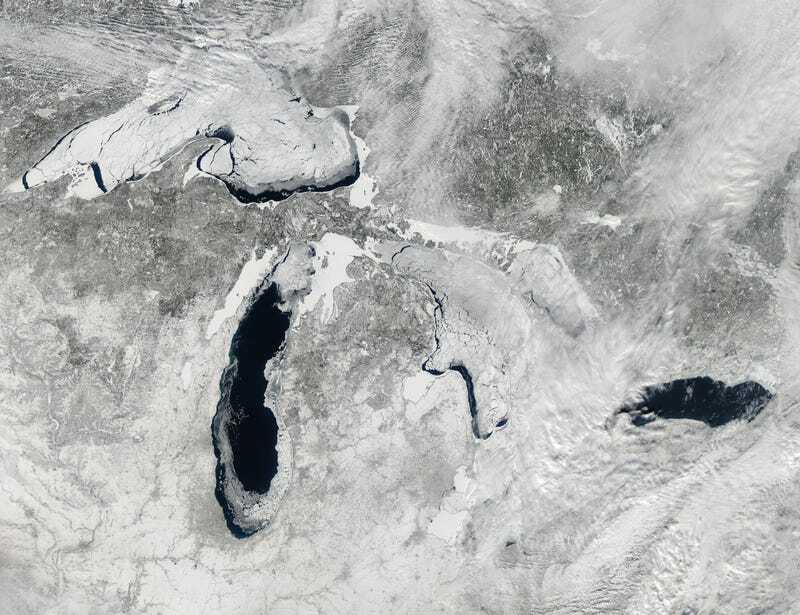 NASA has released this image of the Great Lakes that was taken on 19 February 2014. It shows the Great Lakes being 80% ice covered. There are more images at the NASA Earth Observatory website including false color imagery using "a combination of shortwave infrared, near infrared, and red (MODIS bands 7-2-1) that helps distinguish ice from snow, water, and clouds". The website also includes a detailed write up regarding the factors that have lead to the high ice cover this year. I have attempted to summarize that here. But still, click through for more pictures, it is worth it. There is an interesting true color detail image of Lake Eerie near Pelee Island showing a shipping lane that was opened by ice breakers. You can see that the ice broke up some after the breaker went through as there are floating chunks of ice that still have the visible track through them. This year has seen the highest ice coverage on the Great Lakes since 1994 with 88% of the Great Lakes covered by ice. The long term average, since 1973 is just over 50% coverage. There have only been five times in the past four decades when ice coverage has exceeded 80%. The lowest amount of ice coverage was about 9.5% in 2002. While the polar vortex has been the dominant factor in the cold weather this has likely increased the severity of the cold weather felt by those downwind of the lakes. When the lakes have open water, the cold air blowing down from the arctic will be warmed up slightly as it crosses the lakes. This results in the weather being warmer than it would be, but also contributes large amounts of lake effect snow. Anybody who has dealt with the weather in northern Michigan, the Upper Peninsula, Cleveland or Buffalo are familiar with this.